The science of statistical mechanics is one of the pillars of understanding the thermodynamic behavior of phenomena with a large number of particles, such as gases. Classical statistical methods have stood the test of time for describing Earth-bound systems, such as the relatively dense mix of gases that makes up our air, explains Dr. George Livadiotis, a senior research scientist in SwRI's Space Science and Engineering Division. At thermal equilibrium, where heat energy is transferred equally among gas particles, their distribution falls into a predictable ratio—lots of low-velocity particles to only a few fast ones. The particles move chaotically, colliding with each other frequently. A statistical equation, known as a Maxwell-Boltzmann or Maxwellian distribution, accurately characterizes how this mix of particles of different speeds will be distributed on Earth. However, Livadiotis says, things are different in space, which is actually not empty but filled with plasma, the so-called fourth state of matter. Plasma consists of electrically charged particles—it's neither gas, liquid nor solid, although it often behaves like a gas. Space plasma like the solar wind that flows outward from the Sun has a higher ratio of fast-moving particles. Unlike gases on Earth, they are "correlated," mostly moving in the same direction so they experience fewer collisions with each other. For this set of circumstances, the Maxwellian distribution model no longer works well. Livadiotis has confirmed that a separate statistical equation, called "Kappa," is more applicable for space phenomena. Kappa is the mathematical equation that describes the distribution of particle velocities at thermal equilibrium when there are correlations among particle velocities, as is typical for collision-less space particle systems. "The Kappa equation calculates the distribution of particle velocities at thermal equilibrium when streams of fast-moving particles are moving en masse," he said. "That is the typical situation for particle systems such as space plasmas." Kappa not only predicts space plasma particle distributions better, but also characterizes their thermodynamic behavior better than the Maxwellian model, Livadiotis says. 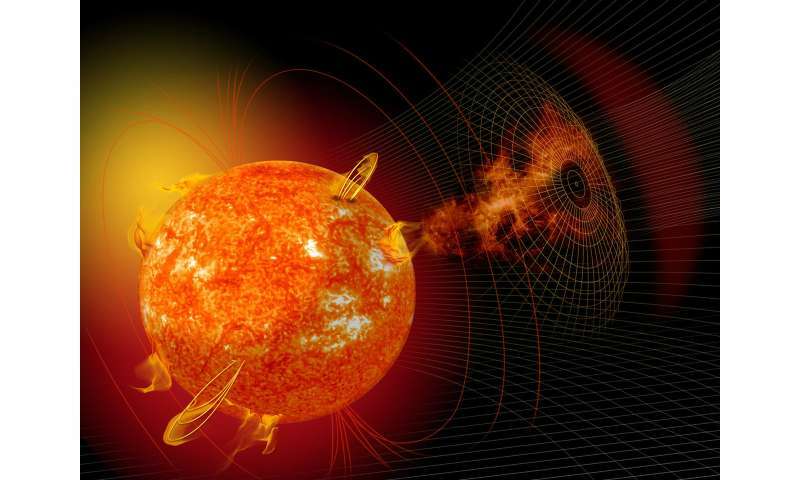 This relates to what happens when extremely hot solar wind plasma crashes into Earth's protective blanket of magnetically charged particles, known as the magnetosphere. "Kappa distributions allowed scientists to make the first temperature measurements of the outer heliosphere," Livadiotis says. "With Kappa, we can dramatically improve our understanding of the nature and properties of space matter, whether it is the solar wind, flares and coronal mass ejections, or rare and more extreme phenomena like cosmic rays." His paper, "Thermodynamic Origin of Kappa Distributions," is published in the June 18, 2018, edition of EPL, a letters journal exploring the frontiers of physics.